That is how Christoph Hintermüller of the Project Management and Research team at g.tec Guger Technologies sums up a machine which can quite literally read the mind. It is intended for disabled patients, and the system made up of electrodes which sit on the scalp translates user intentions into electronic commands. “A brain-computer interface captures various electrical impulses from the head of the user, and decodes them into specific tasks and actions,” continued Christoph Hintermüller. 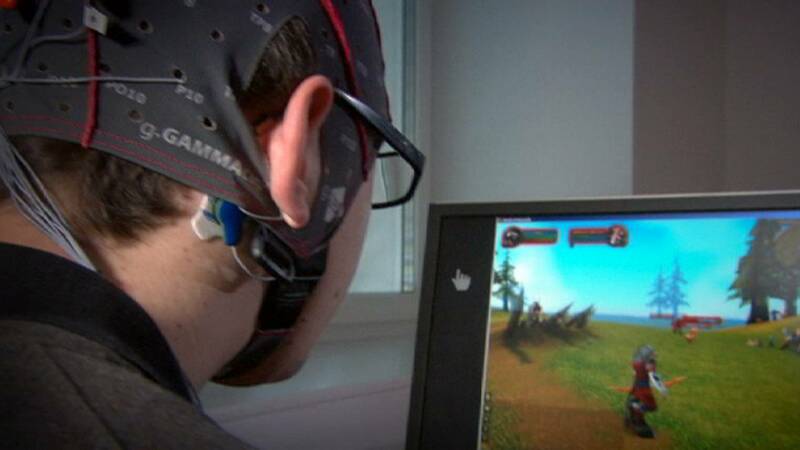 That allows the user to play an online computer game, hands-free. The user selects the commands by simply looking at the blinking arrows on the screen. The frequency of the flashing is reproduced in the brain cortex and read by the electrodes. Developed within a European research project, this technology makes home electronics more accessible. A user can navigate through various on-screen menus by simply focusing attention on the commands. This way even severely disabled people can compose text messages to communicate with others in social networks on the Internet. With further improvement, this system will allow to remotely control robotic assistants and even personal transportation vehicles such as electric wheelchairs. “The system will be further developed to easier integrate with many more systems and programs, and also to use additional electrical and mechanical impulses from the whole body, because some patients still have residual motor functions and they’re comfortable also using them, and this system can be designed to include such signals,” concluded Christoph Hintermüller.